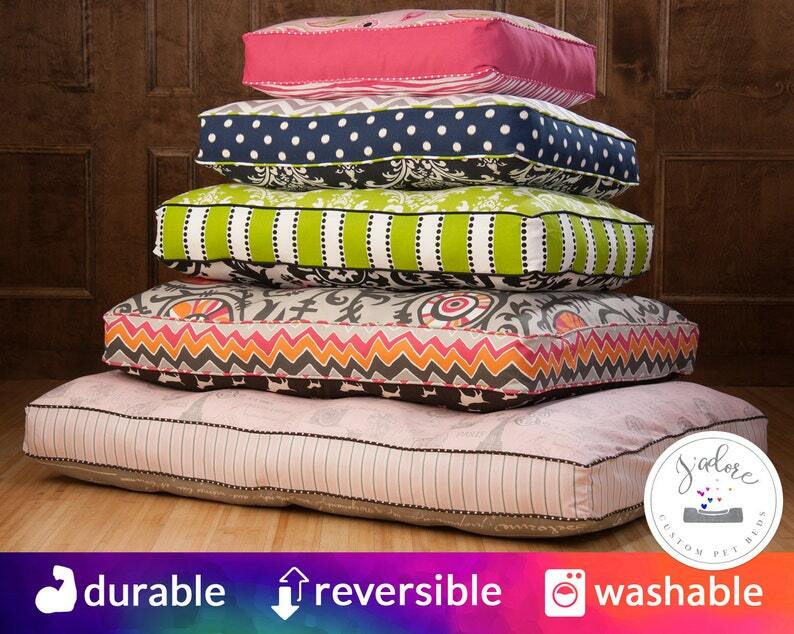 Your J'adore Rectangle Bed will be sewn to the highest quality and has been designed to offer your pet the superior comfort and support they deserve for years to come. It will feature a removable, washable cover with an upholstery grade zipper that wraps around the sides so you can take the cover off easily and throw it in the wash to keep it clean and beautiful. It will be flippable so you can have a new look in seconds and so you can extend the life of the cover since you can use both sides. The inserts will be stuffed with the highest grade fiberfill or foam of your choice so they will last longer and offer excellent support. See below for more details. Fiberfill - Highest quality hypoallergenic fiberfill that won't clump or bunch, and will maintain its support 3x longer than standard fiberfill. Softness can be easily adjusted by removing fiberfill using the zipper. Each insert includes sewn-in channels to hold fiberfill in-place over time. 5" High-Density Foam (HD Foam) - Highest quality polyurethane foam that offers long-lasting firm support. Typical life is 10+ years. 4" Memory Foam (MEM Foam) - High-quality 4lb density hypoallergenic foam that offers pressure relief by distributing weight evenly, preventing pressure points and allowing better circulation. Typical life is 10+ years. Band is 3"h if this option is selected. To make selecting fabrics easy and fun we've created a Bed Design Tool that lets you pick fabrics, add embroidery, and visualize your selections in real-time on your bed. Once your order has been placed you will receive an email confirmation which will include an illustration of your bed if you shared your design with us, or fabric combination ideas if you requested design assistance. Memory Foam Dog Bed Posturepedic | Durable Dog Bed Purple Microvelvet Cute Dog Print | Design Your Own Custom Dog Bed! Blue Coastal Dog Bed - Rectangle Small, Medium, Large - High Quality Fiberfill insert! We are repeat customers and have absolutely loved everything that we have purchased! The quality of the fabric and finished products are outstanding and worth the investment. Alisa is amazing to work with and helps you through the entire process. Extra Large Dog Bed with Foam or Polyfill Insert | Memory Foam, Posturepedic, Greater Swiss Mtn Dog | You Choose Fabric - 36" x 52"